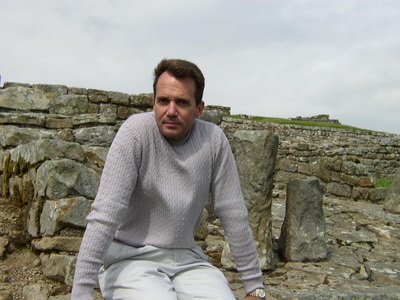 2003 England, Wales - James W. Lett, Ph.D. These photographs and notes are from our nearly three-week trip to Great Britain in July. 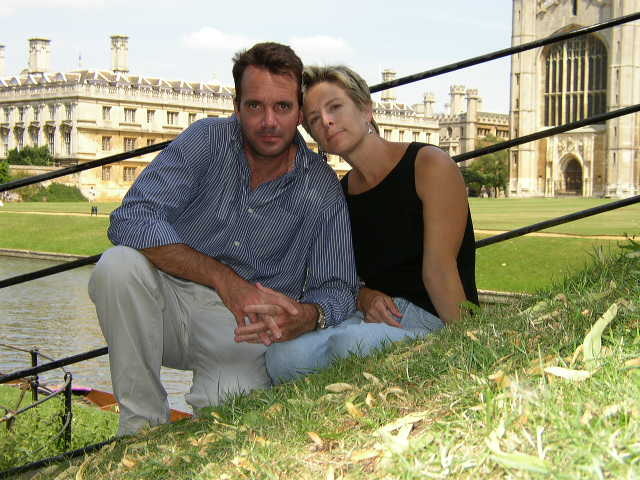 We spent a few days in London upon our arrival, and then rented a car and toured in a clockwise direction from southwest England through Wales to Yorkshire and on to Kent in the southeast. 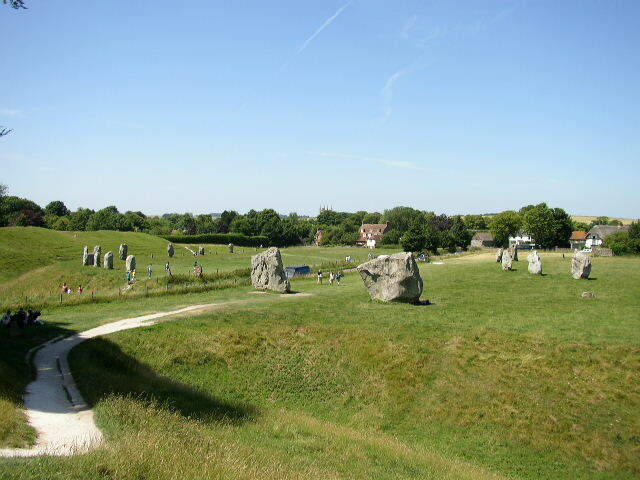 Avebury is located in Wiltshire, west-southwest of London. The Avebury Stone Circle, which was erected about 2500 B.C.E., surrounds the village of Avebury. In the 18th century, local inhabitants smashed many of the stones, believing the circle to have been a place of pagan sacrifice. The 18th century Christians of Avebury had much in common with the 21st century Taliban who demolished ancient Buddhist statues in Afghanistan, and the 16th century Spanish conquistadors who destroyed Aztec temples in Tenochtitlan. Religious people often regard competing religious beliefs as dangerously irrational, but they seldom recognize that their own beliefs are equally so. While it is undoubtedly too much to hope that people of different religions would allow reason to guide their interactions with one another (after all, religious thinking and rational thinking are antithetical), it would be nice if people of different religions would at least be tolerant and respectful of one another's art and monuments, so that the rest of us could enjoy the products of human ingenuity and creativity. The city of Bath is located in southwestern England, just east of Bristol (not too far from the Severn Estuary and the border with Wales). The open-air Great Bath, which stands at the heart of the spa complex built by the Romans in the 1st century, is fed by a natural hot spring that keeps the water at a constant 115° F. Various additional bathing chambers lead off from the sides of the pool. 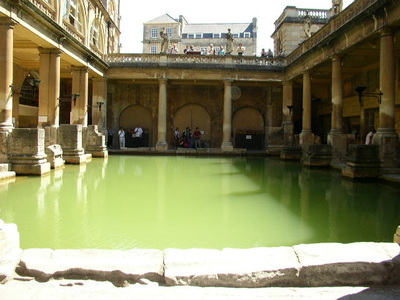 The lead-lined bath itself, the steps leading into the water, the column bases, and the paving stones all date from Roman times (the column bases originally supported a barrel-vaulted roof). Crowded with tourists in the summertime, it's still very impressive. In the background, on the other side of the River Cam, is King's College, Cambridge, which was founded by King Henry VI in 1441 (Cambridge University itself was founded in 1284). Just visible on the near bank is one of the many flat-bottomed open boats used by students and visitors for "punting" on the river. The craft are propelled (leisurely) by leaning on a long pole, and the skill is not as easily mastered as it might sound; the punts capsize easily, and we saw several people take unplanned dips in the river. Fortunately, neither the current nor the abundant ducks are vicious or unmanageable. Castle Howard is located in Yorkshire, in north-central England, where our friends Ann and Peter lived at the time. This stately home, which is still owned and lived in by the Howard family, was built in the early 18th century. The photo shows the back (south) facade. 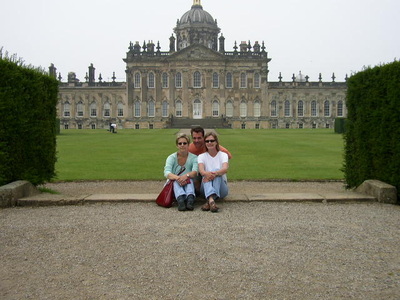 Castle Howard was used as the location for the Granada Television version of Evelyn Waugh's novel Brideshead Revisited; originally shown in the United States on PBS in 1982, it's still widely available on DVD (and well worth seeing). The Goring is a very charming hotel in London with an excellent location--a short walk from Buckingham Palace, and just around the corner from Victoria Station. Our room overlooked the private courtyard garden, a welcome oasis of tranquility in the bustling city. One of the hotel's whimsical trademarks is the near-ubiquitous presence of the resting sheep--they can be found in most rooms and hallways. Family owned and operated since 1910, The Goring Hotel features exemplary service and an excellent restaurant. It's not inexpensive (few things in London are), but we highly recommend it. In 120 C.E., the Roman Emperor Hadrian ordered work to begin on a 73-mile-long wall across northern England, from the Solway Firth in the west to the mouth of the River Tyne in the east. Hadrian's Wall was intended to mark and defend the northern limits of the British province and the northwest boundary of the Roman Empire. It was abandoned in 383 C.E. as the Roman Empire crumbled, but much of the wall remains. 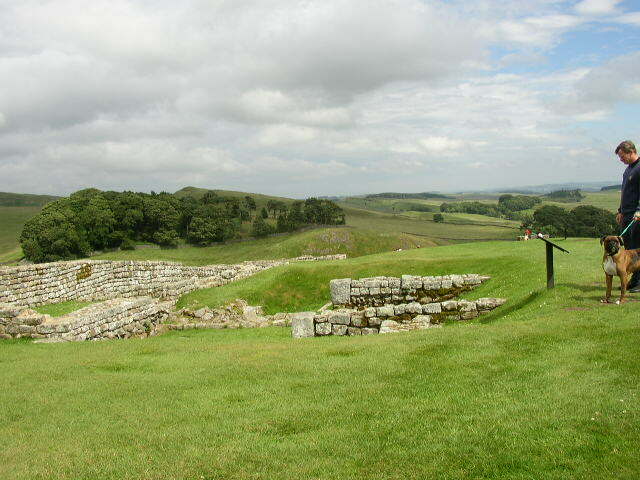 This picture from Hadrian's Wall (like the previous one) was taken at Housesteads Fort, one of the best-preserved of the thirteen permanent forts where Roman garrisons were stationed. 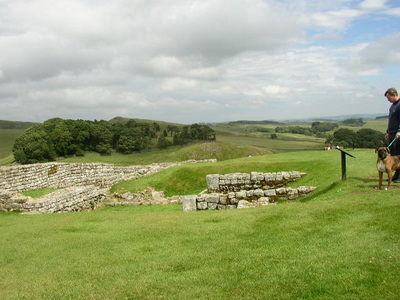 Hadrian's Wall is one of many properties maintained by the National Trust. 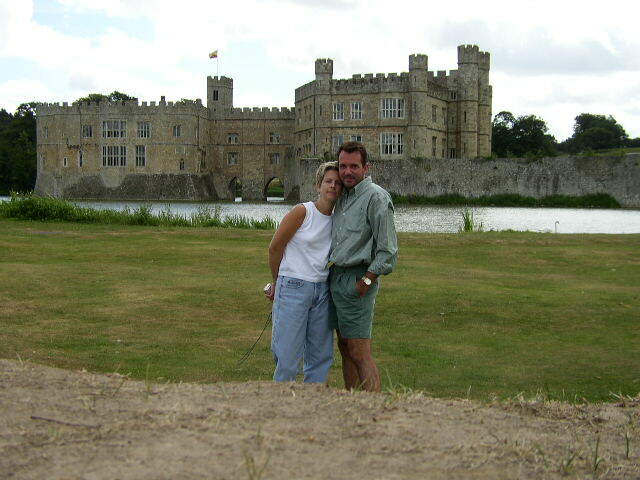 Leeds Castle is located in Maidstone, Kent, a little southeast of London. Listed in Domesday Book, it has been, at times, a Norman stronghold, a royal residence for six of England's medieval queens, and a palace of Henry VII. It later passed into the hands of various private owners, until finally being purchased by "a wealthy Anglo-American heiress," Lady Baillie, in 1926. Since her death, the castle has been managed by the Leeds Castle Foundation, which maintains an elaborate and colorful website about this beautiful and historic place. 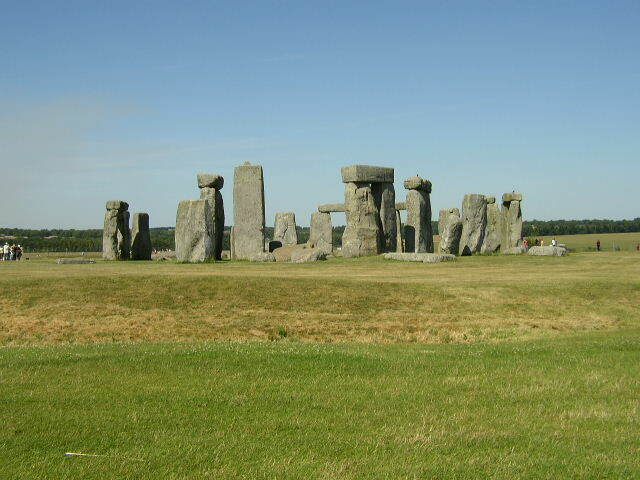 Europe's most famous prehistoric monument was built in several stages beginning about 5,000 years ago. This photo doesn't convey the majesty of the setting: Stonehenge lies near the top of a rise in the middle of the Salisbury Plain, and the standing stones can be seen from miles away in all directions. The largest standing stones, topped by lintels, are sarsen stones; the smaller stones in the inner circle are bluestones. 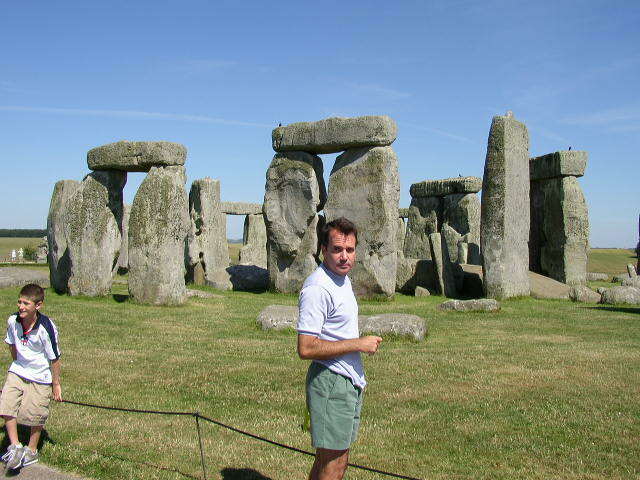 Regardless of the ambient temperature, the bluestones are always warmer to the touch than the sarsen stones (there are samples of both types near the parking area that tourists are allowed to feel). Tourists are no longer allowed to walk among the stones--a path circles the site, with the closest vantage point about fifteen yards away. 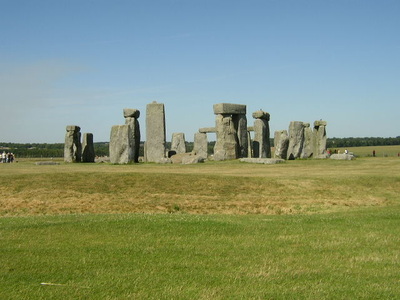 Stonehenge is one of many sites managed by English Heritage. 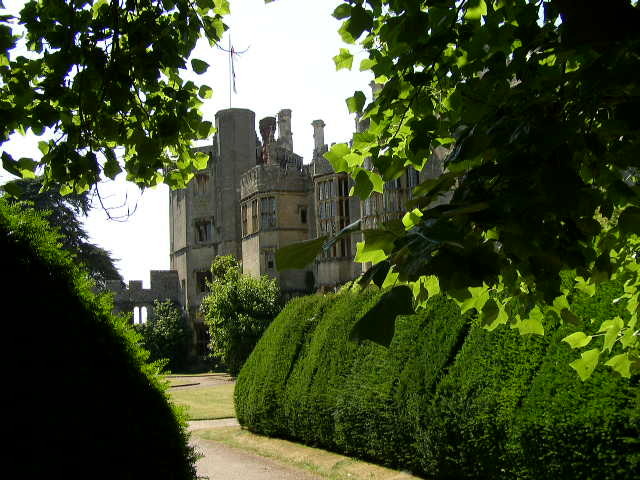 Located in South Gloucestershire, Thornbury Castle was built in 1511. It was home for several years to Princess Mary, who later became Queen Mary I; King Henry VIII and Anne Boleyn slept there in 1535. If you visit, the castle grounds can be difficult to find: after you pass the last of the signs indicating the direction toward the castle in the village of Thornbury, look for a small, nearly unmarked gate at the end of a driveway on the edge of the church property. Tintern Abbey is located on the banks of the River Wye, on the border between Wales and England. 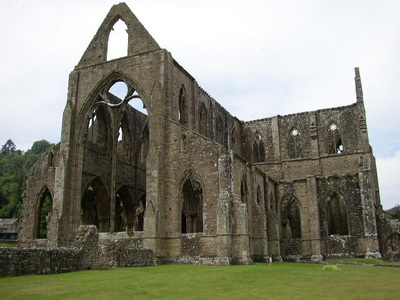 Founded in 1131 by Cistercian monks, it was the richest abbey in Wales by the 14th century, but along with other monasteries it was dissolved in 1536 by Henry VIII. Set in the steep and heavily wooded Wye Valley, it has been an enchanting ruin since at least the early 18th century, when it inspired William Wordsworth to write these Lines Composed A Few Miles Above Tintern Abbey: --Once again Do I behold these steep and lofty cliffs, That on a wild secluded scene impress Thoughts of more deep seclusion. 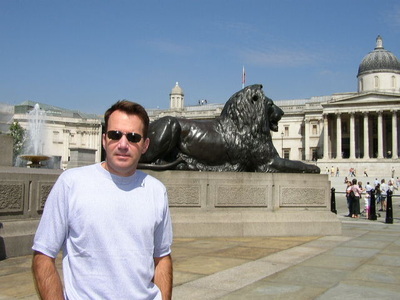 Trafalgar Square, a large, inviting open space in the heart of London, is located northeast of Buckingham Palace at the intersection of several major streets. It was unseasonably warm when we were there in July (temperatures approached the mid-80's), and many people were wading in the fountain to cool off. Shortly after we left, England set an all-time temperature record with a reading of 100°. In the background is the main entrance to the National Gallery, London's pre-eminent art museum. 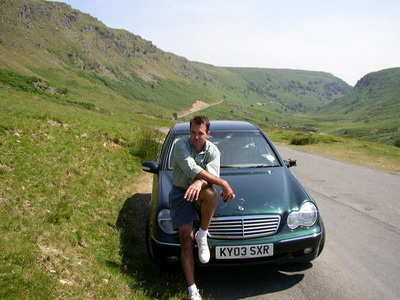 We spent much of one very pleasant day driving through the moors, green hills, and high deserted plateaus of the Welsh Cambrian Mountains. Except for numerous sheep, the area is sparsely populated. The narrow road in the picture included wider turn-off spots every few hundred yards to allow oncoming vehicles to pass (we're temporarily parked in one in the photograph above); other roads we drove on were much smaller, consisting of old sheep drover's paths that had recently received a tarmac surface. Our average speed in six hours of driving was scarcely more than fifteen miles per hour. Distinctly un-American, and delightfully so.